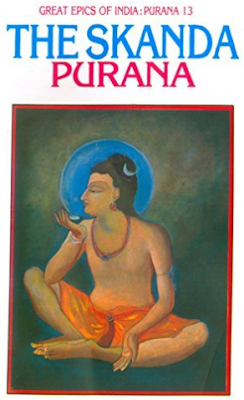 My favourite parts of the Purana were the ones when they talk about the different tirthas. My favourite tirtha was the one of Mahisagarsangam. The word Mahi was the name of a river. The word Sagara meant the sea and the word sangam meant joining, merging or confluence. Its name meant the joining of the river Mahi and the sea. It is a very holy tirtha and is very sacred. I will relate a story about the same. There once lived a king named Shatashringa and he had a daughter. Unfortunately, she had the head of a she-goat. The surprising thing was that unlike everyone else the princess was not alarmed or sad that her head was a she-goat. She remembered her past life and knew why she had such an unusual head. Between Mahisagarsangam and Stambesha there was a network of creepers and thorns. A she-goat got caught in the thorns and was unable to free herself. Soon she died of hunger and thirst. Her body fell into Mahisagarsangam but her head remained stuck. Since her body had fallen into the river she was born as a princess and accumulated a lot of punya but because the head had not fallen the princess was born with a she-goat’s head. The princess went to Mahisagarsangam and found the goat’s head stuck in the branches. She untangled it and cremated it. She then threw the ashes into the river and immediately got the head of a beautiful woman. Such was the holiness of the place. Skanda (Kartikeya) himself had said that bathing at Mahisagarsangam was like bathing in all the holy tirthas of the world. Another holy tirtha is that of Varanasi. It is said to be Shiva’s city. Do you know why it is called such? Once Brahma had five heads and Shiva severed one of them. Severing one of the heads was like killing a brahman which was a terrible sin. The fifth head attached itself to Shiva’s hand and would not go. Shiva tried everything but it remained stuck. Then one day Shiva entered the city of Varanasi and the head fell away. From that day Varanasi has been Shiva’s favourite place in the world. He likes being there even more that Kailash. This was a very interesting purana as it had many different and interesting stories. I loved it when it talked about the different tirthas as there were many stories that I had not heard before. It is a very holy Purana too. If you hear all seven khandas of the Skanda Purana you earn so much punya that it is impossible to measure it. A person who hears even a fraction of a couplet in this Purana goes straight to Vishnu’s abode. On reading this Purana a brahmana attains the knowledge of all the Vedas. A kshatriya defeats his enemies. A vaishya obtains wealth and happiness. A shudra attains lifelong happiness. It grants a long life, happiness and reunions. I would love to read it. What about you?